Why not buy a hands free solution for your car? My Parrot hands free carkit is a product I could not do without. I would recommend that everyone should buy a hands free solution for your car as we are all tempted to use our mobile phone while driving at some stage. I recently read a blog post by Ronan Skehill, Cauwill Technology which praised Sean Ellis, a trainer on iGap, for posing a very tough question that startups need to answer – asking your customers how they would feel if they could no longer use your product. I really enjoyed the post and it got me thinking about products that I would really miss and there are not too many. One that came to mind was my bluetooth hands free kit. Around that time I heard on the radio that the Irish Examiner was reporting that 110 people are being caught in Ireland everyday for using their phone whilst driving. I could hardly believe the figure but yes indeed the Irish Examiner confirmed that 23,000 people were fined for using mobile phones in their car in the first eight months of 2010. My Parrot MKi9000 was installed three years ago when I changed my car. 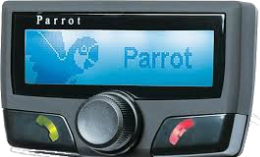 The quality of the calls are superb as the system is hooked up to the car speakers. It is perfect even on the motorway. It automatically hooks up via bluetooth when I turn on the ignition. It is very safe to answer the phone – just a touch of a button. I really like that it is inconspicuous. A few months ago the unit was not working properly. It would not answer calls but I could still place calls. It was very frustrating for the few days that it was not working. When I got around to contacting my installer he called out immediately to our offices. A simple battery change and it was back working normally again. I paid around €300 in total for the unit. It is probably even cheaper now as it is now an old model. It was money very well spent. Cheers for the mention. I would like to add my BlackBerry, bike and haribo jellies to the list! Thanks Ronan, the blackberry is a very interesting one. When i writing the post i was thinking that people love their iPhones. I had a blackberry in a previous job. It was great as you could be at meetings and keep in touch with and on top of your email. And the other big advantage was to have your diary and contacts with you at all times. It is seriously addictive. Haven’t purchased a Blackberry or iPhone yet for Bridgewater but it is on my list when i get some time. Seth Godin in May 2013 writes about being on your phone while in the car…. to stay in touch on our phones–and drive at the same time. of these deeply held beliefs, consider finding a new client. All four? There’s no marketing lever long enough to do this work. solutions I can think of actually, both cheap and fast and effective. do that with movies. Technology, though, can fix what it broke. The second solution is even simpler: when a phone is moving, don’t permit it to accomplish certain tasks. People won’t die as a result. It won’t cost the companies a penny in profit. that a technology be used to alter our culture. But we could.